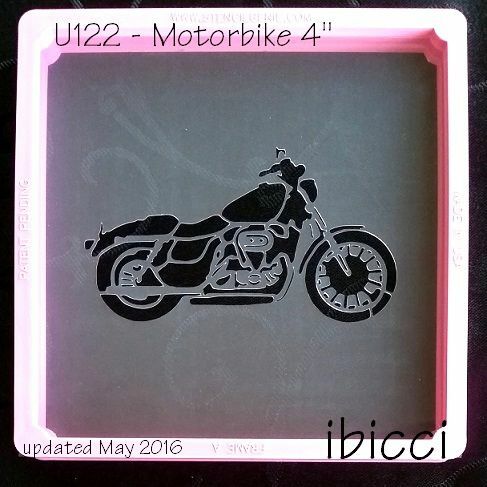 A while ago I cut this stencil for a Birthday cookie set, but I wasn't happy with it, so I was very pleased when Natalia of http://www.cookielicious.co.nz/ asked if she could have one as her husband loves motorbikes. I jumped at the chance of tinkering with it, and this is the happy result. It has been updated now in May 2016 to increase the detail and provide more support for Royal icing stencilling. Due to the amount of detail, this is a large 10cm long design - and will fit best on a 5" or larger cookie or on a large plaque. HOWEVER, it has been cut at 63mm, 2.5" stencil and it came up OK (see below). So if you would like it in a different size, just put a comment in on your order and it can be cut to your specific size.